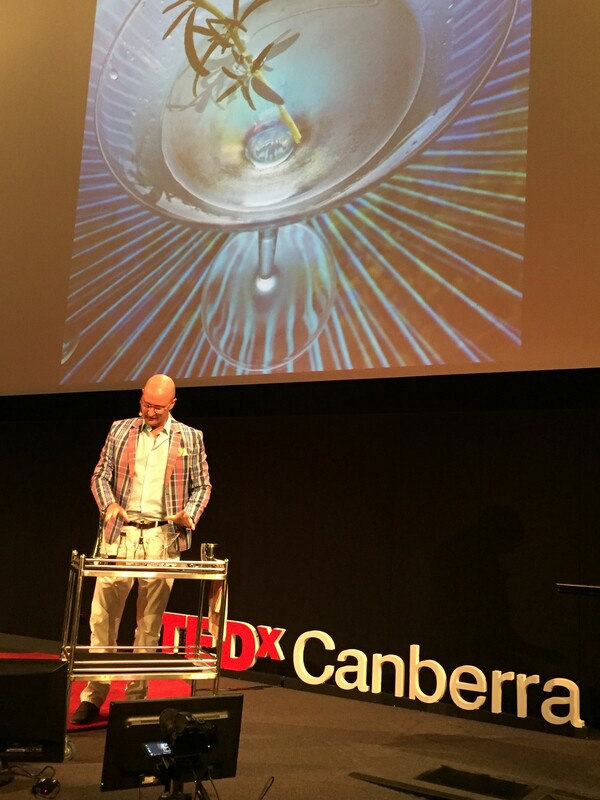 In December 2015 I had the honour of being on stage at TEDx Canberra to end the event with a talk about my pet subject, the Martini. My alter ego, the Martini Whisperer has been about for a few years now and has evolved into the go-to blog for reviews on Australian + imported craft spirits, particularly gin, and Martini culture. I also offer master classes and Martini experiences and have been invited to speak in a range of settings. But a TED talk is something else again, and I thought it may be interesting to share the preparation I undertook to get ready for one of the most important days of my life. Whilst its possible to pitch to be part of a TEDx event, organisers will usually reach out to people they think can shine and bring something genuine to the stage. The ethos of TED is that of ‘Ideas Worth Spreading’ and is strictly non-commercial. They want it to be a platform for ideas and inspiration that can enrich lives. So while I was mindful that my topic was at the frivolous end of the spectrum compared to what normally appears on the famous red dot, I took the invitation very seriously. I wanted to do the opportunity justice, and since it was (to my knowledge) the first ever talk about the Martini, I wanted it be credible, informative and bring the subject to life. I also had the responsibility of being the light relief after a program of serious topics like domestic violence and so it had to be entertaining. Plus, in the back of my mind was the slight possibility that if good enough, my talk might be curated as part of the TED.com YouTube channel for a global audience of millions. So, no pressure at all then! But here’s the thing, beyond the strict parameters of TED talk (18 minutes max, no commercial sell, etc) there is a balancing act in the delivery: you have to be yourself and natural, and also conform the expectations of what a TED talk is. I’m a firm believer in a strong structure in a talk, both in terms of narrative and topics covered. I wanted to do the subject justice TED wise, so any facts had to be accurate, no dodgy anecdotes and I couldn’t really ad lib. So I delved into multiple sources to check any historical things I was going to mention. Also I had the idea of coming to the cocktail from multiple perspectives, to show how it was the culmination of many things: the evolution of craft spirits + distilling, the martini in popular culture + film, my own experiences, famous martini drinkers, etc culminating in making one on stage in a theatrical setting. I then road tested these ideas with the TEDx organiser to check that it sounded good to them and fitted into their vision for the program. Some tips on TED talks mention things like 10 hours prep for every minute which is a bit much in my opinion is a bit much. But once my script was settled the next step was to memorise my talk and internalise it. I broke my talk into six sections and focused on each in turn, then practiced them together. Every day for an hour I would do my talk several times, plus annoy people at dog park or in the supermarket muttering phrases to myself constantly to embed them in my brain. I drafted my talk six times and kept refining it as I spoke it every day for several weeks. Obviously reading and speaking are two different things, and I found I had to simplify my language so it was both easier to say and remember. Plus I had to keep in mind the time limit. So I would record my practice sessions to keep an eye on the time, I was aiming for less than 18 minutes to allow times for accidents on the day and performance issues. As it turned out I landed at exactly 18 minutes on the day! It was a only a couple of weeks out that I added the images to my talk so that I could use them at the right punctuation point, in theory. I did find that each time I did it that I missed a point, or sentence. I resisted the urge to beat myself up about it though, and just did it again. I realised that no-one else knew what I was going to say and if I missed a phrase, they’d never know. Also my talk was structured in a way that I could move things about, by accident perhaps, and it would still work. The TEDx team are all volunteers and support is pro bono. They are also super supportive and positive and would do anything to ensure their speakers get what they need to be comfortable and confident on the day. They are so there for you. They also said something that turned out to be very true about the audience which is particularly TED it seems. They are incredibly positive and engaging: they really want to be there, and really want you to succeed. I could certainly feel that. You’re encouraged on the day to mingle with the people, not hide in the green room, and anything I needed was only an ask away. They were marvellous, a real delight to work with. I should especially thank the performance coach provided by the TEDx Canberra crew, the lovely Katrina Howard who was my coach throughout the process and would check in frequently to see how I was feeling, and offered lots of tips and advice that was invaluable and made all the difference. As I said, the deal with TED is being real. Yes, there are plenty of arch and earnest talks out there by people out to make the world a better place, but I wasn’t a rocket scientist or doing social work, I wanted to shed some light on a great cultural icon and cocktail and the elements that make it possible. So I was realistic about where I stood in the scheme of things. But I knew that for my talk to work I had to a) be myself, and b) deliver the talk in a way that people could connect to unpretentiously. So I ensured there was some vulnerability, self-depreciating humour and that it was a talk from me to the audience without artifice. Whilst the early versions of my talk were sounding a bit like a Wikipedia article, once I started doing things like saying ‘I believe’ and ‘I think’ and more anecdotes on my own experience then it finally came to life. This is where I struggled a bit. I have a tendency to talk quickly when excited, and whilst I’d be mic’ed up I had to ensure that each word landed coherently in the audience. I gave myself a lot of concepts to cover in my talk, including a part at the end that included live music and making a Martini on stage. My delivery in practicing was still stilted and sounded like a lecture. Where was the passion and animation that I normally had when talking about cocktails? I had to find a way in to animate myself and put the (paradoxically) whole TED thing out of my mind. Now, I’m a big Michael Caine fan, and do a dreadful impression of him, and some friends were daring me to include him in my talk. I didn’t do that, but I figured I had to get into character somehow from the get-go. Once I done that I figured the rest of the talk would flow. So a few days before the event, I came up with the idea to have his voice in my head as I said my first few lines, “My tale, is a, head-mix of geo-politics...’ This worked and helped me find the rhythm I needed and opened up my cocktail persona that enabled me to relate my talk in the style I was aiming for. So my talk was coming to together and a few weeks out I chose the 10 martini images I had taken to illustrate my talk. I was going to use them to punctuate the different sections of my talk, partly to keep my thoughts on track but also provide some visual eye candy. I had my cocktail wagon and ingredients organised, and had put the key dot points for my talk on postage stamp sized notes for emergencies in my pocket. A colleague, John Black, had graciously agreed to perform for a few minutes during my talk for some showtime magic, and I knew what I was going to wear. But I had a lot to think about: the timer on the stage counts down from 18 minutes, remembering my lines with no notes and hoping the cocktail wagon was brought on at the right time, and everything chilled as instructed etc etc. I had certainly made life interesting for myself! The live rehearsal a few days before was invaluable. The ending was terrific as planned, and my images looked super on the huge screen behind me, but I did muff my lines and timing was too quick, but it enabled me to get familiar with the space, how much (or little) I could see from the stage. I wasn’t happy with my delivery, but I felt more confident that it could come together fine on the day, hopefully. So the day arrived and I did my best to stay busy and distracted. No more rehearsals, just double check my outfit, props (including back up glasses and booze in case of breakages) and did my best to stay calm. As I mentioned, I was the last speaker, and got on stage about 5.30pm at the National Film and Sound Archive. I genuinely was having difficulty remembering my talk. I had my emergency notes in my pocket, but really didn’t want to use them and only at the last moment put them back in my pocket. Being last really strung out my nerves: not just the expectation of going on stage, but seeing all the other amazing TED talks (both live and recorded that were screened) got me thinking of my own modest skills in comparison. But one advantage was that by the time it was my time I was so emotionally exhausted and tired that I could ‘t get nervous any more. I was spent. So that actually calmed me and I was able to walk up on stage and give the performance I was hoping for. You can laugh, but I did think of that scene in Star Wars when Luke is told by Ben Obi Wan Kenobi to ‘use the force’…. and so I did. Of course things didn’t quite go as planned. The monitor that showed by pictures to me didn’t work, so I couldn’t time easily my images at the pace I wanted, as I need to face the audience not look back, and I did miss a sentence here and there. What was also vital was to finish my talk at the 15 minute mark to allow time for the theatrical element, so I kept an eye on the countdown. Again, the preparation was key here, knowing how long I could talk for at the different sections. But its true what they say, time slowed down and if I landed at a place not in sequence I could think ahead in my mind and bring up a passage needed to bring it around without anyone knowing. The practice had made all the difference, and all the phrases were imprinted in my head. I figured that the key to the success of the talk was going to be the delivery and that’s what I focused on, they didn’t know what I was going to say or do, but as long as what I did do had the right quality of genuineness, coherence, pace and a light touch then all would be well. You can watch my TEDx Canberra talk here.